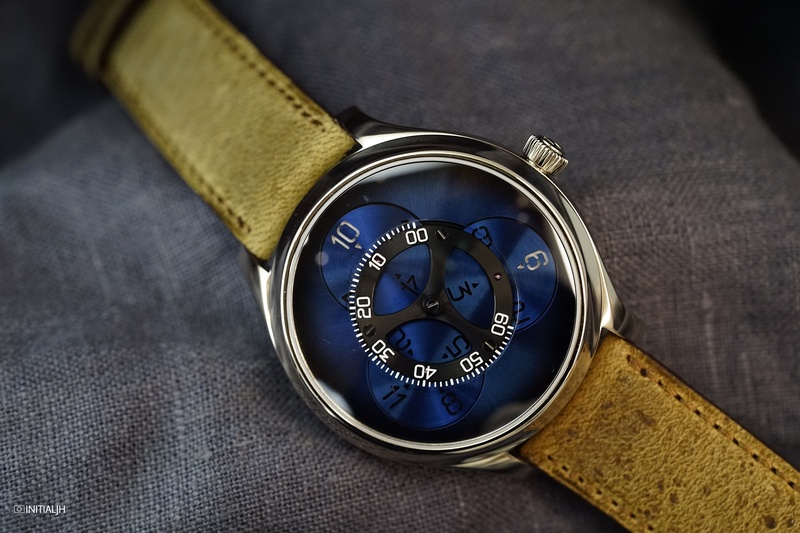 A wandering hours display powered by a new in-house movement with a Funky Blue fume dial. Such is the Endeavour Flying Hours, the first watch from H. Moser & Cie to show the time using a satellite system of discs, and which we had the opportunity to see at the SIHH 2018. The now well known Moser Funky Blue dial is familiar, but the rest is not. One interesting aspect of the watches from H.Moser is that there are members of their collections who are quite tonally diverse, but this dedicated focus on what have now become quite distinctively ‘Moser coloured dials’ somehow manages to bring often quite disparate pieces together. The method of time display on this new watch is unlike previous Mosers. It features planetary gears mounted on star wheels. Starting at the centre, the main disc in sapphire displays the minutes on a 240° sector. Three smaller discs bearing the hour numerals are arranged around it. Each planetary gear rotates on its own axis, revealing the hour in a display inspired by the original planetary systems.The current hour numeral appears in white, following the minute disc as it completes a revolution before disappearing to be replaced by the next hour. Powering this new time display is the new automatic Calibre C806 movement. Based on the Moser Calibre HMC 20, it was developed and produced jointly by Moser and sister brand Hautlence. The new movement’s escapement and hairspring are produced in-house by Precision Engineering AG, a sister company of H. Moser and Hautlence (all owned by MELB Holding). This new movement has a red gold oscillating weight, beats at 21,600VPH and has a power reserve of three days. All of this comes in a white gold case with a comfortable sizing of 42mm and a thickness of 12.3mm. The strap is beige kudu leather strap, and of course there is a matching white gold pin buckle. This new Endeavour Flying Hour is in a limited edition of 60 pieces with an RRP of 32,000 CHF.